Pemmican Beef Jerky is now touting the words "New Style" on the top of their packages. I figured I'd buy a bag and write a review. 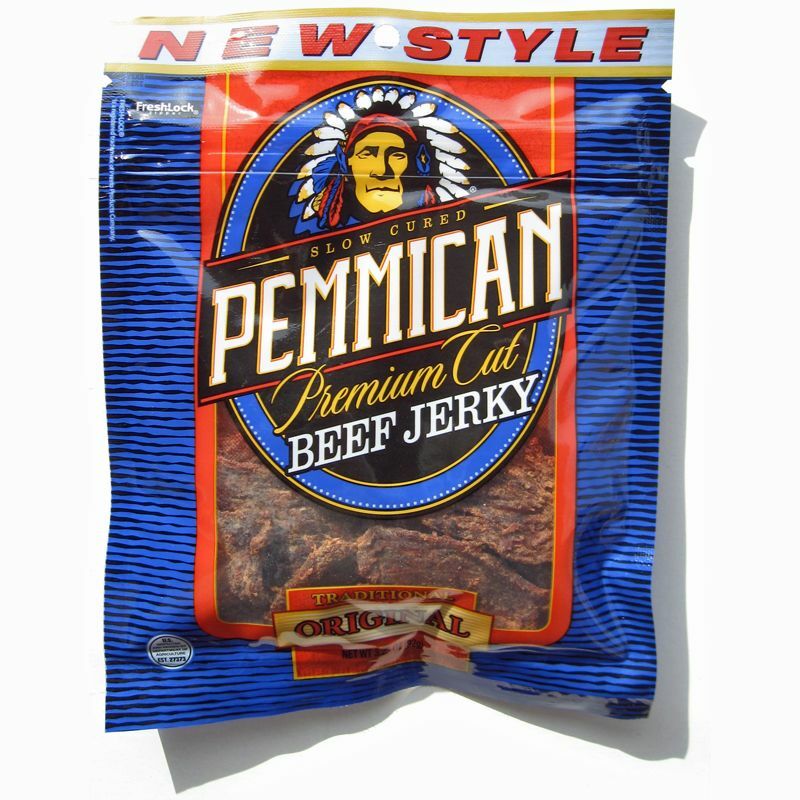 The New Style comes after a year since The Marfrig Group bought the Pemmican brand from ConAgra in July of 2008. The Marfrig Group is a Brazilian-based company better known in the meat snack industry as the parent company of Mirab USA, the largest beef jerky private labeler. Mirab makes jerky for hundreds of brands, mostly retail stores. The New Style is actually the same style and recipe that Mirab already makes for their private label customers. Since they're already geared up to make this specific formulation, switching Pemmican over eliminates the costs of continuing the old recipe while acquiring the thousands of distribution channels that ConAgra had already established. The old ConAgra style and recipe looked like cuts of steak, but was somewhat oily to the touch, and quite soft to the point of being mushy. 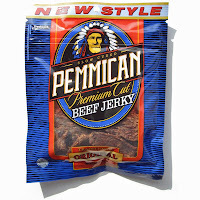 Read my older review of Pemmican's Teriyaki Jerky to find out what it used to be like. 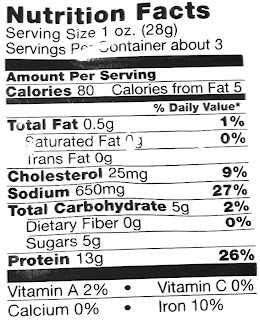 Beef, water, sugar, salt, garlic powder, maltodextrin, monosodium glutamate, black pepper powder, apple cider vinegar, sodium tripolyphosphate, sodium erythorbate, citric acid, sodium nitrite. The first thing I taste from the surface of these pieces is a light sweetness, and a light saltiness. The chewing flavor continues on with pretty much the same. The flavor that seems to dominate this jerky is a combination of light sweet and light saltiness. There actually isn't much other flavor in this. I don't really pick up any natural meat flavors. There's a tiny bit of tanginess in the chewing, perhaps from the apple cider vinegar. 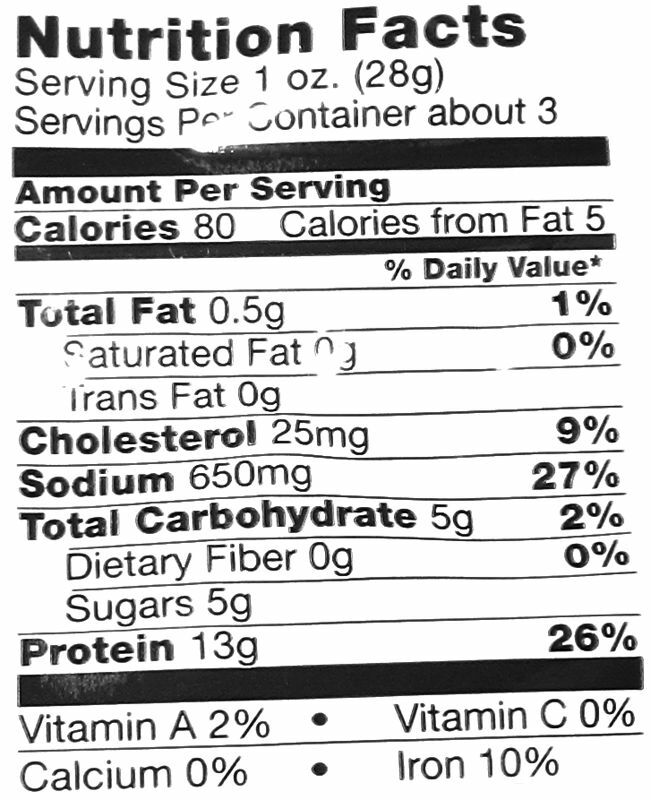 And the black pepper powder listed in the ingredients doesn't really show up on its own. 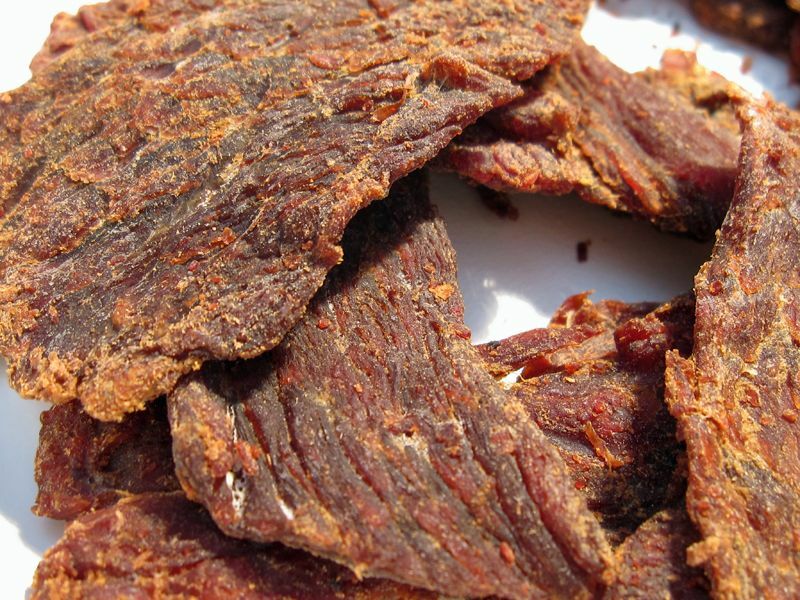 The old Pemmican Jerky had more meat flavor, but not a natural meat flavor. It used to have a flavor that resembled liver, though it appeared to be slices of whole meat. This Mirab recipe doesn't have any meat flavor at all. I wasn't much of a fan of the old ConAgra recipe, and not much of the Mirab recipe either. I've had this same Mirab product many times before under other brands, hence writing this specific review is like rewriting the same review over and over again but arranging the words differently. But I'm writing this again because Pemmican is such a well-known brand and people want to know why their favorite jerky has changed. These are slices of whole meat, sliced to a medium thickness, and in small pieces. This is a dry jerky, with a dry surface feel. However, that will vary depending on the freshness. At its freshest, it starts out semi-moist with a semi-moist feel, and as it sits on store shelves for several months it dries out. This review sample is probably about six months old, considering it has another six months before the expiration date. The pieces have a woody texture on the surface, and don't have much flexibility. Any amount of bending will cause it to crack. Tearing pieces apart seems easy to do, and chewing ranges from easy to moderate. The chewing texture starts out with feeling rough and woody, but pliable. Due to being in the mid-point of its freshness, it seems to crack and crumble apart. It chews down to a soft mass quickly, and at that point it's mostly crumbly, not at all steak-like. When I've had the fresher, semi-moist Mirab jerky, it found it the opposite, being mushy. I don't see any bits of fat on this jerky, nor any gristle or tendon. I didn't find anything stringy either. In terms of clean eating, I don't pick up any residue on my fingertips, but I do get quite a bit of tiny bits falling off as I bite off pieces. I paid $5.99 for this 3.25oz package at an Albertson's grocery store in Menifee, CA. That works out to a price of $1.84 per ounce. 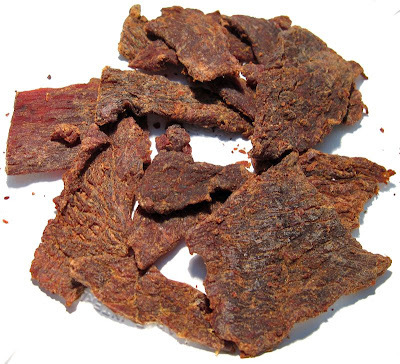 For general jerky snacking purposes, at the $1.84 price per ounce, it provides a weak value. I don't get any snackability from this, even though the price is right on the mark with most major brands of jerky found in grocery stores. I'm giving this a fair rating. The "New Style" from Pemmican Beef Jerky is actually the same old style and recipe that Mirab USA uses for much of its private labeled whole muscle jerky. Granted this review sample I picked up from the grocery store appears to be at its mid-point of freshness, it's not very enjoyable. However, I've had more fresh jerky from Mirab that still seemed tolerable, though still not very snackable, and hence received two-ratings from me under brands like Big Ben's Beef Jerky and Tony Stewart's Original. There's very little flavor in this jerky, mostly a light sweet and a light saltiness, and it doesn't chew like real meat at all, it's either crumbly or its mushy, depending on the freshness. Otherwise, there's a "factory smell" in this that does more to hurt its snackability. If Mirab addressed that it would help make this more tolerable. My recommended beer pairing is any kind of strong flavored ale, like an IPA. The old pemmican flavor I think was a lot better then todays recipe they must be cutting back on something the taste is not like it used to be or it's old or been sitting around to long and I kinda liked the jerky they made price was right that's for sure. I agree the flavor is nothing like it used to be. A lot of companies are cutting back on ingredients or using cheaper ones to save money. Loved the old tougher style, you knew you were eating jerkey. Can't stand any of the new tender jerky, I guess a lot of companies are targeting the metrosexual crowd now. I actually tasted lighter fluid in the "Campfire" recipe. I actually tasted lighter fluid in the "Campfire" recipe. not the natural wood campfire taste.